The National Association of Telecommunications Officers and Advisors (NATOA) joins the growing chorus of business, consumer, and government groups and associations, such as the Georgia Municipal Association, in opposing the Broadband Investment Equity Act (S. 313). This bill will harm the state’s economic growth and do little if anything to promote competition or to bring advanced communications services to the citizens of Georgia. NATOA has long supported community broadband networks because they offer the promise of increased economic development and jobs, enhanced market competition, and accelerated and affordable Internet access for all. Communities across America are ready and eager to bring the economic and social benefits of broadband access to their citizens. But private providers alone will not bring these advanced services to all parts of our country, especially to those communities that do not fit into the companies’ business plans. As a result, hundreds of cities have launched community broadband initiatives, either with private partners or on their own, and many more are now in the planning stages. Communities should be encouraged to step forward to do their part to ensure the rapid deployment of broadband to all Americans, and they should have the freedom to choose what makes the most sense for their citizens. S. 313 will do nothing to encourage robust competition in the communications marketplace in Georgia. 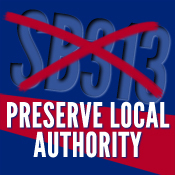 Rather, S. 313 will tie the hands of local governments and hinder the deployment of advanced services to un- and underserved parts of the state, denying those communities the economic and social benefits that broadband services can provide. Rather than encouraging economic growth, S. 313 will simply drive more private investment capital – and good jobs – from Georgia to neighboring states, such as Tennessee. Rather than erecting further barriers to entry, Georgia should be encouraging community leaders to develop networks that make sense for their communities, including public-private partnerships and systems wholly owned by municipalities.